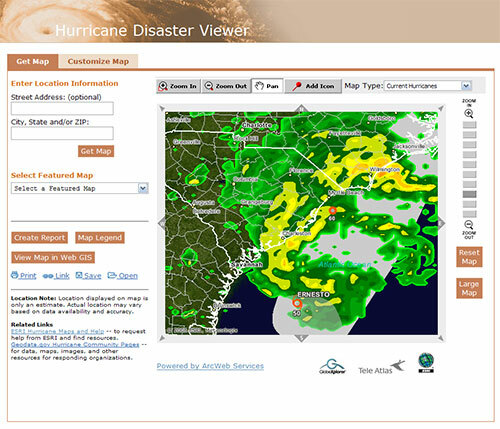 I’ve got family in Charleston, SC so I figured I’d fire up the ESRI Hurricane Disaster Viewer and see what is going on. I’m shocked (well I guess I kinda expected this) that ESRI hasn’t updated this viewer with the new ArcWeb 2006 stuff. It is still stuck behind that retro HTML viewer. I’ve looked at [ArcWeb Explorer](http://www.arcwebservices.com/awx/index.jsp?c=-79.2922003043303 32.2118748144926&sf=2460777&ds=ArcWeb:GlobeXplorer.Deluxe_Tiles.World ArcWeb:TA.Streets_VectorsForHybrid.US&glt=rasterTileGroupLayer vectorGroupLayer) and I don’t see any “Hurricane Widget”.